Khattala is suspected of killing U.S. Ambassador to Libya, but claims "the American government has nothing to do with me." On Wednesday, a U.S. federal court named former Libyan Commander Ahmed Abu Khattala as a suspect in the attack that killed U.S. Ambassador to Libya Chris Stevens and three other Americans. Investigations led following the attack on September 11th, 2012 of the U.S. consulate in Benghazi, Libya killing four Americans including Ambassador Chris Stevens. Only recently has the Justice Department filed charges against Ahmed Abu Khattala, then leader of an Islamist militia group called Abu Obaida Bin Jarrah says The Washington Post. Khattala claims to have since left the militia group and is now working as a contractor. Khattala has denied all allegations of involvement. Khattalla’s name is among a number of other suspects, yet it is unclear of the charges he and the others face. Officials have released pictures of three out of the five suspects in order to gain further information about the men. 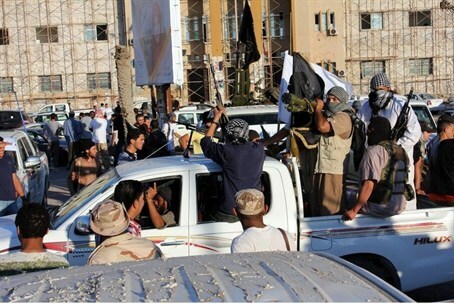 The pictures were captured of the men near the consulate prior to the attack and are allegedly members of a Libyan militia group called Ansar al-Sharia. During the eve of the attack, Benghazi residents witnessed Khattala at the scene directing fighters as the group set the consulate compound on fire. These investigations are currently ongoing and are a matter of great controversy in the American political sphere.